Labor Day was the theme of the meeting with Toastmaster Jan Campana. We had three very different and wonderful speeches, I’m sure you would have loved. Mike Ruthenberg spoke about how to purchase a vehicle and the pitfalls and tricks to look out for. Mark Shapiro spoke about become ‘Crispy’ and the wild 60’s drug culture. Terry Hewins speech was on Smoke Alarms and he artfully demonstrated his PowerPoint Prowess. We also announced our upcoming SpeechCraft. This 5 week program will give Speechcraft participants (guests and/or new members) opportunities to tune up their speaking in short order. If you know someone with a speaking event coming up and they are looking to improve their speaking performance, invite them to check out Speechcraft. If you are Persnickety about speaking well in front of others, than you may be interested to hear about our “Bizarre” Toastmasters meeting with Toastmaster Linda Teichman. 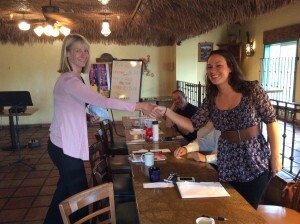 Linda, had the pleasure of congratulating Natalie Meehan on her Best Speaker award. Believe it or not, Natalie was also a First Timer too! It is not often that someone comes to Toastmasters, Joins, gives their Icebreaker (first) speech and wins Best Speaker for the day! Natalie’s speech was creative and Natalie is a natural. It will be fun to watch Natalie progress as a speaker. 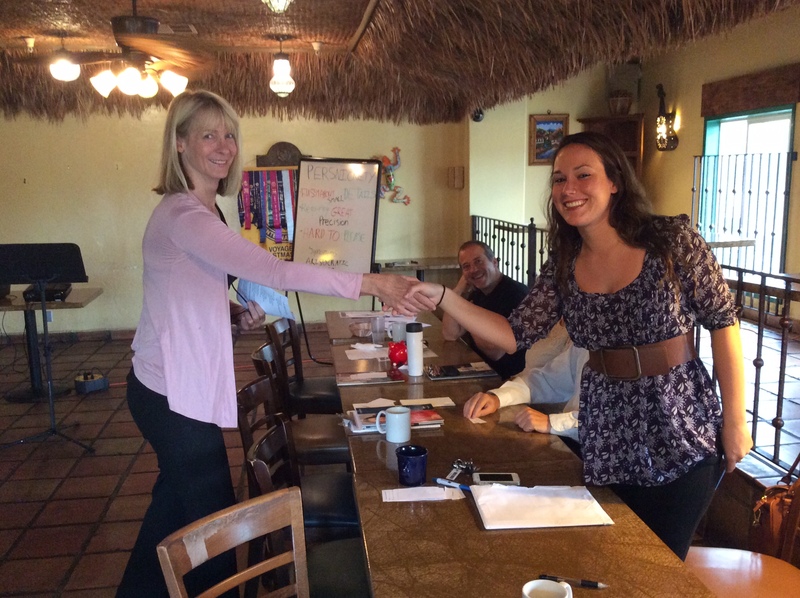 Other first timers were Jessica Walton as our timer and Cynthia Paloma as the ‘Ah Counter’. You don’t want to miss next weeks meeting with Toastmaster Jan Campana with the theme Labor Day. Bring a guest and join us for a meeting that is sure to educate and enchant. Thursday, August 28, 2014 7:00 am at Cafe Coyote in Old Town. You can’t wind back the clock, but if if we could, you would want to have been at the Voyagers Toastmasters meeting Thursday. Beth Bateman brought us “Shark Week” as the theme and we had a special guest Antwon Lincoln. Our last speech of the day was delivered by Antwon Lincoln. Antwon is the winner of the District 5 speech contest and as a result is headed to Kuala Lumpur to compete in the International Speech Contest. Antwon’s speech was called “Mama Style”. The speech was fantastic with Antwon captivating the audience. At the recent training, our club was recognized for our long string of consecutive Distinguished Club awards. Mark Epstein and Mark Imhoff were also recognized for their service to Toastmasters as Area Governors. Beth Bateman, our Area 12 Governor, presented the awards. Don’t miss next week with Toastmaster Amy Gilstrap. She will explore words that are new to the English lexicon like Google and other words that are relatively new to our language.